Hey it's the kuripot blogger again popping on your blog updates and social networking sites. Baka maging trademark ko na ang pagiging kuripot ko. Haha! Ask my blogger friends, true naman eh! Anyway, I want to share to you guys another bazaar I'm so attending because I bet it'll be filled with awesome concessionaires who are among my favorites. Oh, and another thing, Hyphen will be there. Excited? Well I can't wait! Read on to know how you can score free passes. Well, before I give you guys the mechanics on how you can score some free passes to the bazaar let me tell you guys first the details. The Heat Wave Bazaar was organized by the same people who organized the Noel Bazaar. It will be held at the World Trade Center Metro Manila on April 13-15, 2012. 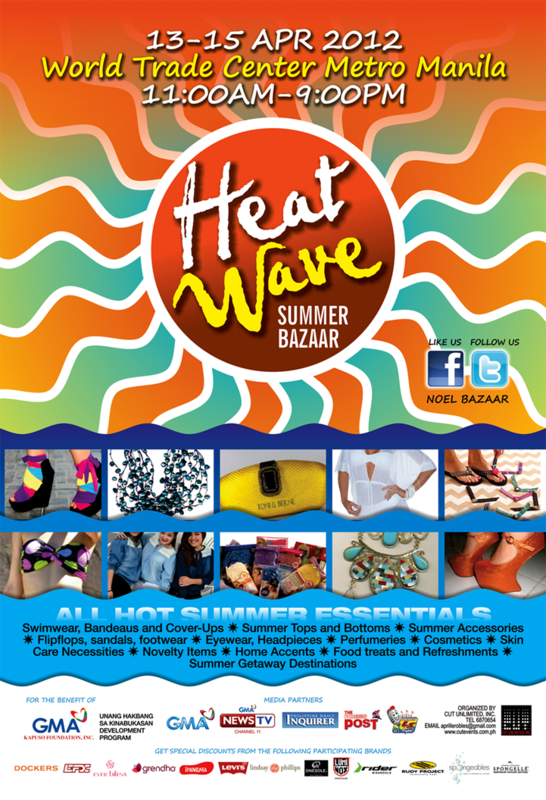 The bazaar will be open from 11:00 AM - 9:00 PM. So, what will you expect from the bazaar? You can go get your summer swim wear, fashionable summer clothes, accessories, flip flops, cosmetics, skin care products, novelty items, summer getaway destinations and there's food of course! But don't worry, shop without the guilt because the bazaar is for the benefit of GMA Kapuso Foundation Unang Hakbang Sa Kinabukasan Development Program. Hey Gellie! Hyphen will give you 5 more pairs of tickets so more of your followers can win! 1. Sunscreen Lotion - This should be on everyone's top list. It is very important to protect our skin from the sun's harmful rays. 2. Sunglasses - to protect my eyes. 3. Flip-Flops - I just want a more laid-back look, a girl should always stash a great pair of flip-flops in her bag!